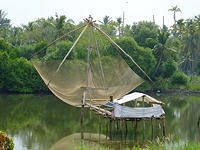 I have always wanted to visit Kerala for the sea, harbour, fishing ports, lakes and the famous Kerala backwaters. It has been on my bucket list for a long time. Now I was able to combine a visit with inspections of hotels and tours during our our fam trip to Kerala this year. We started our trip in Kochi (Cochin) where many of our clients have started their 17 day Southern India Kerala itineraries with our company. My business partner, Rob, and I arrived at Kochi airport on the morning of Good Friday 25th March and were met by our local representative and our driver. Our driver would be with us all the way until we said goodbye for last few days in Mumbai. 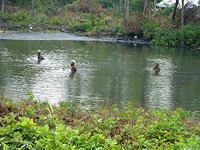 The car journey from the airport to the centre of Kochi takes about 40 minutes through lovely countryside scenery. We stopped to look at the famous Chinese fishing nets and river fishing. Since our driver is a keen bird-watcher he was also able to point out local exotic birds to us as we passed by the fields, rivers & trees. This is a great area for bird watching. 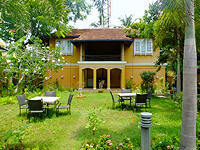 We arrived at Fort Kochi & checked in at the Tea Bungalow for a stay for two nights. The Tea Bungalow is a lovely old house that was used by the Brooke Bond Tea Company as accommodation for its staff and visitors, It is located in a local street among many other houses, shops and companies, about 15 minutes walk from the centre and harbour front of Fort Kochi. This is giving a less touristy atmosphere to it. The house is hidden behind a tall wall with a gate opening from the street to the driveway through the front garden with a small lawn surrounded by trees, exotic plants and flowers and tables and chairs on the lawn for tea. The two storey golden yellow building was shining in the morning sun beyond the lawn. One can look back to the old days with admiration. Our room was in the front garden courtyard in a new wing built to match the old bungalow. There are four rooms in the old house with traditional features, especially the suite rooms with four-poster beds. 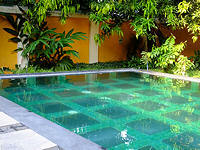 The upstairs rooms open from a long gallery overlooking the garden with its swimming pool. The garden is sheltered by many tall trees & greenery providing a haven for birds. We have seen a kingfisher fly down to get a drink from the pool,and plenty of crows and other garden birds. It has the atmosphere of a private house. We are happy to carry on using this hotel in our Superior hotels category.